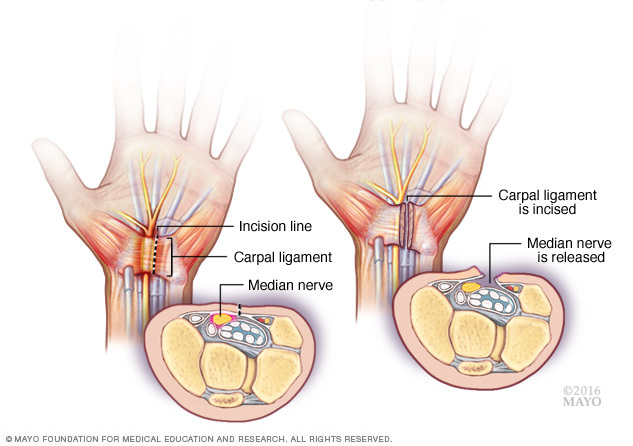 Carpal tunnel is the entrapment of median nerve at the wrist. Carpal tunnel syndrome leads to pain, numbness and tingling in first three fingers of the hand sparing the palm, weakness of thumb, loss of grip strength and dexterity. Symptoms are usually worse at night and are eased by shaking the hand. Anything that irritates the median nerve at the wrist can lead to carpal tunnel syndrome. This can include a fracture around the wrist, swelling due to inflammatory conditions such as Rheumatoid arthritis, changes in the balance of body fluids as in pregnancy and menopause. It can also include workplace factors such as vibrating tools, poor position of the hand, obesity, diabetes mellitus or double crush syndrome. Carpal Tunnel Syndrome needs to be differentiated from wrist tendonitis, cervical radiculopathy, cervical derangement and thoracic outlet syndrome leading to similar types of symptoms. If not treated at the right time, it can lead to varying degrees of functional loss. There are two general approaches for treatment for carpal tunnel syndrome – conservative treatment and surgical treatment. •	Education: It is important to maintain healthy weight, exercise and manage any health problem such as diabetes. An Ergonomic assessment of your workplace can help to prevent recurrence. •	Decompressing the nerve: Mobilisation of certain carpal bones such as the capitate helps to create more space for the median nerve and hence decompress the nerve. Stretching the retinaculum and improving the flexibility of the muscles around the wrist will also help. Nerve and tendon gliding exercises will ensure the unrestricted motion of the nerve. •	Grip strengthening exercises, fine motor and hand dexterity exercises and postural correction. •	Treat the spine if your symptoms are related to double crush syndrome. •	Taping the wrist or using a Wrist splint. The earlier the carpal tunnel syndrome is treated, the less likely are the chances for symptoms to return. Resolution of the symptoms after surgery can be more temporary if the symptoms originate from elsewhere. Our experienced Registered Physiotherapists at PhysioNow will assess you to find out the actual cause of your symptoms and will help you to get rid of your symptoms. Call today! You should be a part of a contest for one of the finest websites on the net. I most certainly will highly recommend this website!